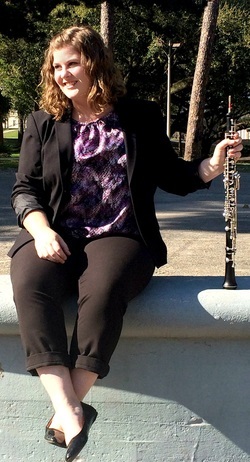 Oboist Grace Woodworth is an active performer, teacher, and chamber musician currently based in the Nashville area. She has performed nationally and internationally, appearing with the Nashville Symphony, Austin Symphony, Baton Rouge Symphony, National Repertory Orchestra, Rapides Symphony, Genessee Symphony, Temple Symphony, and Banff Festival Orchestras. Currently, she performs as principal oboe of the Paducah and Murfreesboro Symphony Orchestras. In addition to maintaining a vibrant private studio in the Nashville area, Grace serves on the faculties of Belmont University and Tennessee State University and freelances as an orchestral and session musician. Grace's playing can be heard on the soundtracks for major motion pictures such as Home Again (2017) and My Little Pony (2017), the hit show Fargo, and video games including Star Wars: Knights of the Old Republic. Grace has participated in many prestigious summer music festivals, including the Banff Festival Orchestra and Masterclasses, Brevard Music Festival, Pierre Monteux Festival for Conductors and Instrumentalists, Marrowstone Music Festival, Hot Springs Music Festival, and most recently, at the National Repertory Orchestra in Breckenridge, CO. She has performed in numerous master classes, working with the Berlin Philharmonic Wind Quintet, Alex Klein, Robert Atherholt, Erin Hannigan, Carolyn Hove, Marion Kuszyk, and the Imani Winds. She is a three-time finalist for the Nashville Symphony’s Young Artist Concerto Competition, and first prize winner in the NOLA Chamber Fest Competition in 2016 with her woodwind quintet, West Chimes Winds. Originally from Cookeville, Tennessee, Grace received her Bachelor of Music degree in oboe performance from the University of Texas at Austin. While at UT, she was awarded “Outstanding Senior Recital” for her BM degree recital, which is chosen by faculty vote. Grace continued her studies at the Eastman School of Music, receiving a Master of Music in 2013. She successfully defended her dissertation and received her Doctor of Musical Arts from Louisiana State University in 2016. Grace's principal teachers have included Richard Killmer, Rebecca Henderson, and Johanna Cox. In her spare time, Grace enjoys spending time with her friends, family, and her rescue dog Penny.